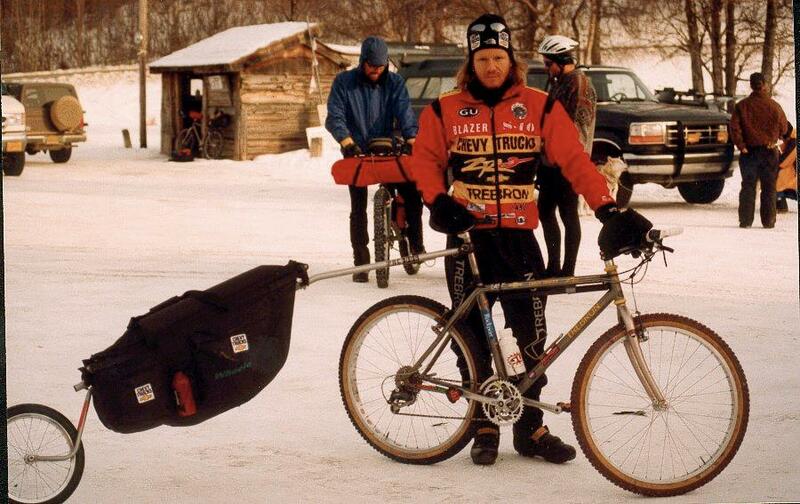 John Stamstad poses with his mountain bike and trailer set-up before the 1997 Iditasport Extreme. Photo by Charles Bingham. As 55 cyclists, skiers, and runners gear up for this weekend’s Iditarod Trail Invitational, human-powered racing on Alaska’s Iditarod Trail quietly turns thirty years old. In 1983, “the father of the Iditarod” Joe Redington launched Iditaski, sparking three decades of endurance races across frozen Alaska. Racers push bikes across Knik Lake at the start of the 1997 Iditasport Extreme. Photo by Charles Bingham. It’s not easy to find a comprehensive source of information about the timeline of human-powered Iditarod racing, and thus confusion about the races persists. Even though the ski, bike, and foot races have taken place under the umbrella of the Iditarod Trail Invitaitonal and the Susitna 100 for more than a decade, it’s still common to hear both races referred to as “Iditabike.” I thought it would be fun to track down a brief history of Iditabike based on online resources. This is hardly a comprehensive history, but it does provide a glimpse into the timeline of this daunting challenge. Racing on the Iditarod Trail dates back to 1973, when Joe Redington and others devised a dog-sled race that would travel 1,000 miles across Alaska to Nome in recognition of the brave mushers and dogs who shuttled life-saving serum to the Western Alaska village during a 1925 diphtheria outbreak. 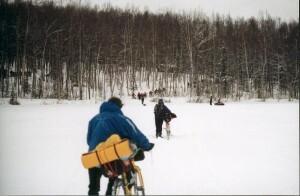 Ten years later, Redington and others launched the inaugural Iditaski, the first human-powered race on the Iditarod Trail. In the mid-1980s, a hundred-mile snowshoe race formed. But human-powered Iditarod racing took a turn toward international fame in 1987, when what was then still a relatively new sport — mountain biking — found its way onto the Iditarod Trail. Iditabike was born. “We don’t have any idea what’s going to happen, but we’re willing to give this thing a try,” race organizer Dan Bull told Kelly. 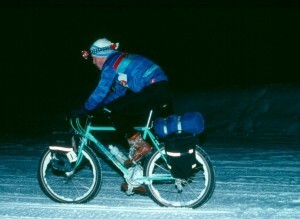 Dave Zink, winner of the 1987 Iditabike in 33 hours and 50 minutes. Photo from Charlie Kelly. The Mountain Bikers of Alaska figured ten Anchorage-area riders might take on the challenge. But after a cycling publication picked up the story, the race drew twenty men and six women, most of them sponsored riders, from six different states and as far away as Los Angeles. Although small in terms of riders, the extreme nature of Iditabike drew sponsors and international media attention before the word “extreme” was even embedded in mountain bike racing’s nomenclature. Race organizers required racers to bring an array of survival gear needed to camp out in 20 below temperatures and blizzards. Since there was no set standard for carrying such gear on bicycles in the winter, each racer adopted their own strategy — some dragging sleds, others strapping panniers to racks. “Because no one had any way of knowing what would work on the long trail, secret weaponry was the order of the day and, given the opportunity, mountain bikers are a creative bunch,” Kelly wrote. Mike Kloser rocking that ’80s style. Photo from Charlie Kelly. Two riders from the Lower 48, Dave Zink of Minnesota and Mike Kloser of Colorado, set a blistering pace for the first forty miles of packed trail on what these days would be regarded as terribly skinny tires for snow riding. Then soft snow set in on the Iditarod Trail, and the two cyclists spent the next fifteen hours pushing and struggling with their bikes for sixty miles into Skwentna Roadhouse. There, they were surprised to meet a well-known Alaska mountain biker named Roman Dial, who didn’t have the $100 entry fee for the race but wanted to be involved. He rode in on a packed snowmobile trail that followed the Yentna River and beat the leaders to the halfway point. “Zink and Kloser were in low spirits from their exhausting efforts and the prospect of returning by the same trail. 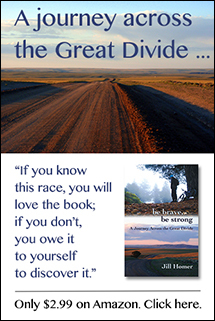 A spontaneous command decision was made to send racers back by the trail Dial had used,” Kelly wrote. Thirteen of the 26 starters finished the race. Zink and Kloser went on to cross the finish line together in 33 hours and 50 minutes, although Kloser would insist that Zink won in the finishing sprint. Martha Kennedy of Minnesota was the first woman to finish Iditabike in 42 hours and 59 minutes. In 1988, 53 riders lined up for the second annual Idiabike. The event drew filmmaker Mark Forman, who made a 24-minute documentary that aired on the Discovery Channel. “Bicycles on Snow” can be viewed online in three parts at this link. The 1988 race also drew higher profile riders such as Race Across America finisher Chris Kostman, who documented his Iditabike experience for PBAA Journal. As an experienced ultra-distance racer, Kostman expected to dominate the event, but struggled with soft snow and tire punctures. After finishing in tenth place in 45:53, Kostman received a special award for the racer who showed the most humility. “The Laddie Shaw Award” was named in honor of a first-year Iditaski racer who coined a phrase that is now famous in Iditarod Trail racing — “Cowards won’t show and the weak will die.” Shaw went on to drop out first in that race, inspiring the award for the most glaring hubris to be humbled by the Iditarod Trail. Iditabike drew a similar number of riders in 1989. That same year, race organizer Dan Bull, along with Les Matz, Roger Cowles and Mark Frise, launched the first mountain bike expedition along the thousand-mile length of the Iditarod Trail, reaching Nome in 21 days. The race itself also inspired a growing number of bicycle innovations. Dave Ford of Girdwood, Alaska, developed an “Icicle Bicycle” that incorporated two rims welded together side-by-side, mounted with two tires for a double-wide wheel. Ford, along with other Alaska riders and tinkerers such Billy Koitzsch, were instrumental in the ongoing development of what is now called the fat bike. In 1991, Bull merged the three events into the combined race Iditasport, held concurrently under all three disciplines, along with a “triathlon” division. In 1992 he added a runner division for those who didn’t want to wear snowshoes. The event drew more racers as interest in endurance events grew in the 1990s, tripling to as many as 200 participants and boasting purses of $50,000 to $80,000 for winners. Dominating the 1990s Iditasport was was Mountain Bike Hall of Famer John Stamstad, who at the time was lucratively sponsored by Chevy Trucks. Stamstad won 170-mile version of the race in 1993, 94, 95 and 96. 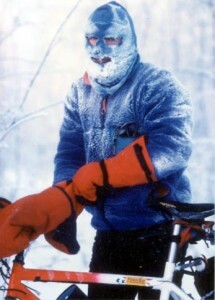 In 1997, the race organization began offering a 350-mile race to McGrath called the Iditasport Extreme, which Stamstad won that year and in 1998, 99, and 2000. Iceman in the 2001 Iditasport. Photo from Fairbanks Cycle Club. 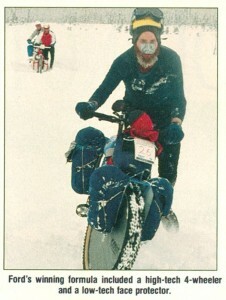 Bull took the organized race to its inevitable big step in 2000 with the Iditasport Impossible, an official 1,000-mile race to Nome. Colorado cyclist Mike Curiak won the race on the Iditarod Trail’s Northern Route in 15 days, 1 hour, and 15 minutes — a record that still stands as the overall fastest human-powered time on the Iditarod Trail. As Iditasport expanded, unrest began to creep into the organization. Bull cited financial strain from the race, which he claimed made no money due in part to expensive promotions and prize purses. During the 2000 race, Bull had a falling out with co-organizer Richard Larsen and Iditasport’s board of directors over a checkpoint dispute according to an article published in the Peninsula Clarion. There was talk of lawsuits, but the organizers parted ways with Bull hanging on to the Iditasport name and the others forming a 100-mile race called the Susitna 100. Merchant told Peninusla Clarion that while out on the trail in 2001, he was approached by a group of veteran racers about forming a new race. They too decided to split with Bull and the Iditasport to form their own event. The following year, the Iditarod Trail Invitaitonal began with a 350-mile race to McGrath and a 1,100-mile race to Nome. The ITI was billed as a ”no frills, nonprofit race put on by racers for racers.” There was no required gear, no mandatory checkpoints, and no purse. Twenty-seven people signed up for the 2002 event. Although Bull initially said he would continue to hold the Iditasport in competition with the ITI, the original race seemed to fizzle out shortly after Merchant stepped in. It’s unclear where Bull went in the aftermath. Little has been publicized beyond a few whispered rumors since he dropped off the radar shortly after the 2001 Iditasport Extreme. But suffice to say he was a larger-than-life personality with a legacy of colorful and astonishing stories. Of course the Iditarod Trail Invitaitonal lives on with a host of its own stories and characters. This year’s race begins at 2 p.m. February 24. You can follow the progress at this link. Thanks for the mention of my participation. I’m Charlie Kelly, and the magazine that announced the first race in 1987 was mine, the FAT TIRE FLYER, which inspired the riders from the Lower 48 to participate..